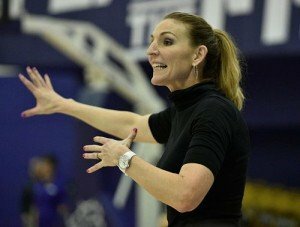 TCU coach Raegan Pebley guided the Horned Frogs to a winning record and to the second round of the WNIT in her first year last season. Photo courtesy of TCU Athletics. Raegan Pebley enters her second year as head coach at Texas Christian University this fall. She got her first head coaching job in 2003, when Utah State reinstated their women’s basketball program. In 2012 she was named head coach at Fresno State, where she guided the Bulldogs to the NCAA Tournament in her second year. The former Raegan Scott was a standout at Colorado and was chosen 21st in the 1997 WNBA draft. She played two years in the league, for the Cleveland Rockers and Utah Starzz. From 1997-2001, she was an assistant coach at George Mason and Colorado State. Sue Favor: It’s crazy to think the season is almost here. Are you ready? Raegan Pebley: It doesn’t feel like we have an offseason anymore. September seems like July. But I’m excited to get our season going and build our routines. We travel in September and are so much on the road, and workouts broken up. Sue Favor: You spent two years at Fresno State before moving to TCU. 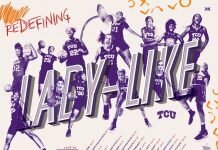 What was it about the TCU program that appealed to you? Raegan Pebley: I was really happy at Fresno State and wasn’t planning on being there for such a short amount of time. But the decision about where to coach is completely dictated on family. My parents live here in Texas as well as four of my siblings. So the chance to be near them was too good to pass up. I had resigned myself to not living by family anymore, and thing thing about Texas is that Texans usually hire Texans. This opportunity came up and it was a total godsend. To be at an academic institution that I raelly respect, and to be in a great conference that I played in – one that really affirmed women’s basketball from the beginning. It’s such an honor to be here. Sue Favor: You’ve had an interesting career path through different schools. What was your overall career objective when you got into coaching? Raegan Pebley: I didn’t have an overall career objective. I’m a relationship-oriented person and that’s how my parents raised me to be. My dad was a coach, and it wasn’t about egos. I’ve become engrossed in the people around me and whom I serve. I was never about “this is how I get there.” I’ve got to be at peace. Sue Favor: What is your coaching philosophy? How do you characterize your coaching style? Raegan Pebley: I believe my responsibility as a coach is to prepare the women through using basketball to learn how to be their best selves. How to operate through positive relationships; how to find and keep those. Everything grows from that. I believe in creating an environment of horizontal leadership instead of vertical, in that everyone gets the opportunity to flex that leadership muscle. I want everyone to grow and get the confidence to lead. Vertical leadership has two team captains for one year, so you miss out on three years. We do horizontal leadership: everyone is a captain, everyone is responsible to lead. Everyone has leadership gifts. Not everyone who is vocal is a good leader – sometimes those are the worst ones. What we strive for is to create a productive environment. Sometimes positive is over-used, wrongly defined and misused. Some of the characteristics are catching players doing it right, and using that as opportunity to teach. I like to keep it intense and efficient to make best use of time. We practice at a TCU pace. Skill development is a gigantic part of our practices. A third of our practice is skill development. We play position-less, as that’s the direction of our game, and playing that way increases IQ and versatility. The game is constantly evolving. Sue Favor: What’s your favorite part of your job? Raegan Pebley: Practice. I love practice. I love watching our assistant coaches coach, I love competition in practice. I love what practice exposes about a person and a team. I love adversity and celebration in practice. It’s an intimate space where you have to be vulnerable to get to your best. I love creating that environment. 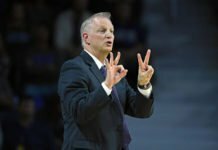 Sue Favor: What’s the biggest challenge in coaching? Raegan Pebley: There’s a challenge in staying really focused on your process and goal. A lot of times those end goals are cliché in some ways – everybody sets the exact same goal. Sometimes it’s uncontrollable goals, or goals important to others besides your teams. We try to be process-focused: today, the next pass, the next practice, the next game. Another big challenge with the job today is helping women in modeling that basketball isn’t who you are it’s what you do. 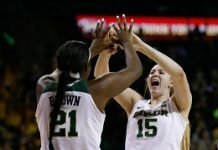 Now women’s basketball is getting a lot of attention, and you can lose what your identity is and think that it’s wrapped up in basketball. Sue Favor: Not too many coaches can say they played in the WNBA. How has that experience shaped you as a coach? Raegan Pebley: It exposed me to more coaches. I knew I wanted to coach even as a college player, and even more so as a WNBA player. I played to learn. It exposed me and showed me how I didn’t want to do it. It definitely opened my eyes to a different way to play the game. I’d love to see our game go to the FIBA rules, with the 24-second shot clock, the 8-second back court, substitutions, wider lanes. It’s exciting seeing more players retire and enter the coaching field. I had two previous members on my staff last year, have Edwina Brown this year. She has a lot of knowledge. Sue Favor: What are your goals at TCU? Raegan Pebley: One day at a time. I haven’t talked to my team at all about where we are ranked in preseason. Success isn’t a straight line, it’s a process. Part of what I’d like to accomplish here at TCU is sustainable success. One that doesn’t compromise the academic environment of TCU. The academics here are tough. I love the way Tara (VanDerveer) does it; she’s uncompromising. She doesn’t dummy it down. I’d like us to sustain a level of success, and that we do it with women who are graduating to be leaders in our community.